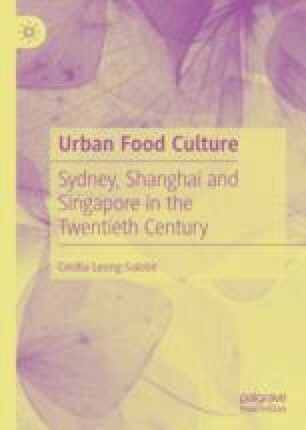 This chapter uses cookbooks published in twentieth-century Sydney, Shanghai and Singapore to examine the history of foodways in the three cities. In Singapore, cookbooks used by the colonial mistress were similar to those used by memsahibs in India. Apart from listing the foods consumed, cooking methods and types of meals eaten, cookbooks illustrate the relationship between the colonizer and the colonized. Only a handful of colonial cookbooks were published for the Shanghai residents. Australian cookbooks written in the 1900s were mainly by women, and recipes were usually of English origin. Promotional cookbooks were published by companies to advertise their goods and services. There were also community cookbooks that were compiled from recipes contributed by individuals in the community. Another category of cookbooks discussed are war-related cookbooks. Cope, Suzanne. 2018. How Iconic Cookbooks Reflect the Politics of the World Around Them. Literary Hub. August 24. https://lithub.com/how-iconic-cookbooks-reflect-the-politics-of-the-world-around-them/. Sighted 25 Aug 2018. Singley, Blake. 2013. A Cookbook of Her Own. M/C Journal 16 (3). http://www.journal.media-culture.org.au/index.php/mcjournal/article/view/639. Accessed 30 May 2018. ———. 2013. Cookbooks for Making History: As Sources for Historians and as Records of the Past. M/C Journal 16 (3). http://www.journal.media-culture.org.au/index.php/mcjournal/article/view/717.